Take Current Affairs quiz February 5, 2019 to enhance your General Awareness. Practice with our esteemed Current Affairs quiz February 5, 2019 questions which covers all important events across India as well as World. Make use of all important Current Affairs quiz February 5, 2019 questions with answers updated here, at free of cost to succeed in all competitive Exams and Interviews. Aadhaar made mandate for the _______ installment PM KISAN. Farmers who wish to avail themselves of benefits under PM-KISAN must have Aadhaar identification to get the money from the second installment, which would be paid by July 2019. PM-KISAN is a new income support scheme announced in the Union Budget. How much did the Karnataka Sports Ministry seek from the Centre for promoting sports and building infrastructure? The Karnataka Ministry for Youth Empowerment and Sports said that he has sought Rs.500 crore for the sports promotion and to build infrastructure facilities in the State Budget for 2019-20.
Who is the Monaco Ambassador to India? Patrick Medecin is the Monaco Ambassador to India. Which of the following is ISRO's 40th Satellite? The Indian Space Research Organisation (ISRO) is all set to launch its 40th communication satellite GSAT-31. What type of Satellite is ISRO's GSAT-31? ISRO is planning to launch GSAT-31 which is a communication satellite. Which State government has approved the creation of the Mulugu district? The Telangana has approved for the creation of Mulugu as a new district. It is carved out from Bhupalpalli district. Who is the incumbent President of Venezuela? Nicolas Maduro is the current President (partially recognized) President of Venezuela. Who is to be recognised as the interim President of Venezuela by U.S. and 11 European Nations? Eleven European nations joined the U.S. in recognising opposition leader Juan Guaido as Venezuela’s interim President. This is to heighten a global showdown over Nicolas Maduro’s socialist rule. Which of the following conducted the Swasth Naarri, Shakti Hamarari campaign in Maharashtra? The Indian Cancer Society (ICS) launched Swasth Naari, Shakti Hamaari campaign in Mumbai, Maharashtra to spread awareness of cancer among underprivileged women and enable early detection of the disease. ICT Academy Bridge 2019 Conference Inaugurated in ------? ICT Academy Bridge 2019 Conference Inaugurated in Tamil Nadu. Around 1.38 lakhs MSME Projects set up by women entrepreneurs. India-Monaco Business Forum Held in ------? India-Monaco Business Forum Held in New Delhi. Which scheme is introduced by Odisha government to boost education for farmers children? Kalia scholarship scheme is introduced by Odisha government to boost education for farmers children. Are you looking for right place to enhance your Knowledge on Current Affairs of 5th February 2019 through effective Quiz section? FreshersLive grants you the advantageous Current Affairs Quiz questions with accurate answers for 5th February 2019 which covers all the important events, supreme Awards, major occurrences in the National as well as World level. All important Current Affairs Quiz questions of 5th February 2019 are updated instantly in this page. Everyday at least 25+ Current Affairs Quiz Questions are displayed in this FreshersLive page. Correct Answer for each quiz question is given at the end of the entire 5th February 2019 Current Affairs Quiz questions section. You can estimate and upgrade your GK by attending these useful quiz questions. 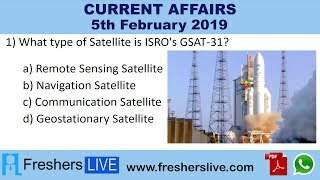 Entire quiz questions of 5th February 2019 Current Affairs covers Competitive Exam as well as Interview point of essentially important topics like International News, National News (ie. Indian Affairs), Science & Technology News, Environmental News, Bills & Acts Passed by Government, Defence News, About important Persons, Places, Banking & Economical News, Awards & Honours, Sports News, Revolutionary Updates on Arts & Culture, Obituary, Summits & Conference, Important Committee, Schemes, Appointments, Important Days & its Theme for Current as well as upcoming Year, Books & Its Authors, Agreements & MoUs, Budget, Taxes, Various Important Lists & Indexes, Visits by World Presidents, Prime Ministers, Political affairs and all Current Events. 5th February 2019 Current Affairs Quiz Questions updated in this page are prepared in the sense to help all aspirants to succeed in various Competitive Exams like UPSC IAS and other Civil Services Examination, Various Bank exams like IBPS PO, IBPS Clerk, SBI PO, SBI Clerk, RRB PO, RRB Assistant, Insurance exams like LIC AAO, UIIC Assistant, Railway Exams, Various Central Government Exams like SSC CGL, SSC CHSL, and more. Attempt all the Current Affairs Quiz Questions of 5th February 2019 and evaluate your score by matching your response with the correct answers mentioned at the end of this quiz questions section. By practising the FreshersLive Current Affairs Quiz Questions on a daily basis, you can surely succeed in the competitive exams as well as the interviews easily. Make use of this ultimate resource to the fullest and quickly achieve your goal!